The inspiration for this candied orange peel confection came from Black Book Kitchen Diaries – I was sold the moment I saw the pictures. Not only did they make it onto my Christmas gift list (which is always rather hopeful but impractically long) but I actually managed to make them too. Halved 6 organic oranges and squeezed out the juice. Removed the innards as best I could leaving as much pith as possible on the peel. Cut the peel into 1/2 cm strips. Boiled the peel in water for about 15 minutes. Drained the peel and repeated the process twice more (I wanted to leave some bitterness, the original recipe cooked them for longer and had one more change of water). Heated 100g sugar and 50ml water until the sugar had dissolved. Added the drained strips and simmered for about 45 mins until the peel had started to turn translucent. Drained the syrup and used this in lots of other recipes. Put the peels on a rack to dry – initially for 24 hours (see below). Melted 80g 78% Trinitario chocolate from Cuba. Half dipped the dried orange peels and laid them out on silicone paper until set. These were wonderfully succulent the day after I put them up for drying, but I thought they needed a bit longer so that they wouldn’t stick together in the jars. Unfortunately, I managed to forget about them for 4 days – oops. Luckily, the candied orange peel was still edible and still very tasty, but it veered more to the chewy than the succulent! Despite being soaked in syrup, these really weren’t too sweet. They were very orangy but had a hint of bitterness which complemented the chocolate well. Although, this was a fiddly job and not my favourite sort of kitchen activity, the result was so good, I shall be making these again. The chocolate I used from Pierre Marcolini was a 78% grand cru trinitario from Cuba and it was delicious; a fantastic melt in the mouth experience. It had a fruity aroma and fruity notes when it first hit the tongue. This was followed by notes of butterscotch and finally coffee. Melting the chocolate was a wonderful nose experience – the kitchen smelt delightful for a long time after. I was very impressed with this chocolate. Update December 2011 – On making candied orange peel again, I peeled the oranges rather than squeezing them first and this worked much better as the peel was cleaner. This time around I dried them for 24 hours only which made them much juicier and then rolled them in caster sugar before storing. Oh! I have always wanted to try these. What a delicious treat. This is going to make me look so silly, but I didn’t know orange peel was edible! Mind you, soaked in syrup and dipped in chocolate sounds marvellous! Well done for making something from your To Do list – mines is a mile long! Good to hear that these weren’t too sweet after the syrup soaking! The chocolate you teamed the slices with sounds just fabulous. 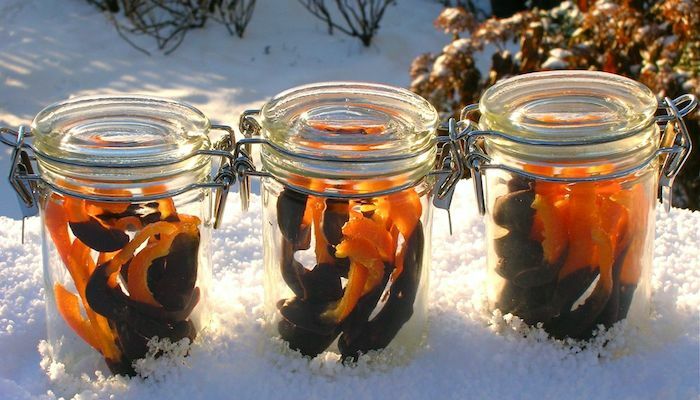 They look beautiful in those jars sat in the snow! I’ve seen many recipes for this before, and yours looks just as delicious! What a beautiful picture of them in the snow. I’m impressed with your creativity too! They look great, I like the half dipped effect too. These look so good. I wonder if you could dry the peel in the warming oven of the Aga? What do you think? I will keep an eye out for that chocolate, not seen it before. As anothe comment says, the oven, even the Aga warming oven, may be too hot. But they dry nocely laid on baking parchment on top of the Lids over the Aga hotplates. Wow sounds like you dipped in a pretty special chocolate! I’ve made these many times now – there’s something healthy about them, no?? When I made candied citrus peel, I was very impatient and tried to dry them out in the oven – not a good idea!! you did such a lovely job with these peels..i really love how pretty the ones in jar looks:) thank you for sharing this and have a great day. Bridgett – they are well worth a go. Hazel – thank you. The chocolate was truly delicious and we were just lucky with snow at the right time. CityHippy – it’s as weird for us to think of you guys in shorts as it is for you to see us in snow. I must confess, I did feel a little bit proud of my jars of peel. Claire – thank you, it’s always good to get a bit of a boost. Chele – it would be a real shame to cover up all of that gorgeous orange colour. Kath – I suspect the warming oven would be too much – maybe above the aga. I’ve dried orange slices for xmas decorations overnight in the warming oven and they came out completely dry. Gillian – have you tried any chocolate from Marcolini? I think you’d probably approve. Do you sell peel and is it popular? BVG – thank you. No, I suspect an oven would be rather too much. Do try them again. Blackbook – thank you, I fear mine don’t look half as good as yours but thank you for the inspiration and recipe. Thank you and BVG seems to agree that ovens are not such a good idea. I will have to learn some patience then. Gosh these do look delicious and although fiddly, quite simple to make really. These look great! They’d make an awesome garnish for a cocktail or even served with duck a l’orange. Fabulous! Utterly fabulous! I am definitey going to try this! They are very impressive and I’m amazed at your patience – it’s the sort of thing that would drive me nuts. Your friends and family should be honoured to receive such wonderful gifts. Agree with comments about the jam jars in the snow – lovely. I saw something similar being made on River Cottage Bites and was really taken up with them. They really do look fabulous. Janice – you’re right simple, but time consuming. Travel Food Phil – thanks, or just served with a cup of coffee. Wendy – great, look forward to seeing your version. Grazing Kate – patience isn’t my strong point, but it was a one off (or certainly a very occasional)! Luckily, these were particularly appreciated by recipients – always good to know. Celia – thank you. Ha! You lazier than me? Not possible. I was fairly happy with how they looked but glossy tempered chocolate would have looked even better. Kitchenmaid – thank you. It’s a good taste combination but I just so loved the colours. MaryMoh – thanks. You and me both. Maggie – would be interested to see it being done – tips for preparing the oranges would be particularly good. Ananda – maybe I should open a shop? C – Thanks. I remember the previous Christmas seeing all of the fabulous things people had made, but when this year came along, I couldn’t remember what I’d seen or where I’d seen it! This was on my list to make over Christmas, never got around to it! Yours look brilliant, and love the way you packaged them up in the jars. These look so good! I really like how you have presented them in pretty jars. Hannah – thank you. I liked the idea of giving food in something that would remain useful after the contents had disappeared. Have always wanted to make this; they looks beautiful here! Bookmarked! Wow, a fantastic present idea. It does look fiddly but the end results look great. I’m sure anyone given these would appreciate the effort.